State Bank Of India Released SBI PO Recruitment Notification 2019 on 01.04.2019 in order to Recruit 2,000 Probationary Officer Posts at SBI Branches. So, from the Graduates/ Charted Accountant Qualified contenders Online SBI PO 2019 Application Forms through sbi.co.in. 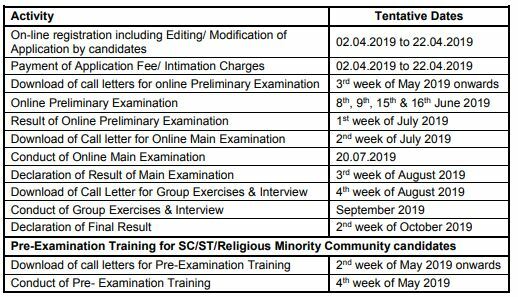 Respective Dates of which the SBI Probationary Officer Recruitment active is on 02nd to 22nd April 2019. State Bank of India Clearly mentioned the Category wise Vacancy with Qualifications, Age Limits, Fee to be paid, Selection Procedure info on the SBI PO Notification. So, that must be verified first for knowing all the details. Because SBI Does not accept any of the SBI PO Application from the contender even though they do not possess any of the qualifications. State Bank Of India, one of the leading Bank in India Released State Bank Of India Probationary Officer Notification 2019 at www.sbi.co.in for employing the 2,000 Posts of PO for the various branches available across India. 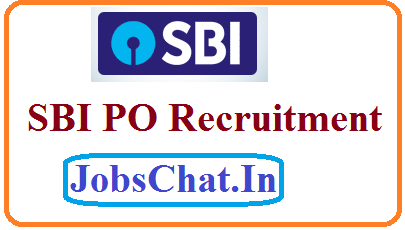 As most of the Unemployed Ones are waiting for this SBI PO Recruitment 2019 in order to get selected in SBI Bank as it offers the best Emoluments in the Banking Sector. As the State Bank of India comes with the Detailed data with the SBI PO Notification along with Application form mentioned below, the Contenders first do verification of those in order to confirm whether they meet all the details or not. If Respective Contender is eligible, they may go immediately send the www.sbi.co.in Probationary Officer Application Form and visit Jobschat.in to get SBI bank updates. On the State Bank Of India PO 2019 Advertisement, Distribution of 2000 vacancies Category wise is given clearly and selection also be done as per those data. So, Contenders irrespective of those particulars have to register for the Latest SBI Bank PO Recruitment 2019 only during 02nd to 22nd April 2019. Only Online Applications will be accepted by SBI Officials. If any of the contenders send the Offline Form, it will not be accepted at any cost. So, aspirants who do not know the Online registration process have to check them from this page and have to do complete the application filling and sending the SBI Bank PO Application in Online. Contenders in order to Apply For the sbi.co.in PO Recruitment 2019 must have to Gross Graduation in any discipline/ Chartered Accountant/ equivalent qualification from a recognized University. Those who are in the Final Year of their Graduation may also apply provisionally subject to the condition that, if called for an interview, they will have to produce proof of having passed the graduation examination on or before 31.08.2019. As on 01st April 2019, Candidates must have a Minimum Age Of 21 Years and Maximum Age of 30 Years to register for SBI Probationary Officer Recruitment 2019. SBI Officials to the Selected Contenders of SBI Probationary Officer Jobs will provide the Emoluments which will range from Rs.23,700/- to Rs.42,020/-, But the Initial SBI PO Salary will be of Rs.27,620/- Per Month. As the SBI Bank Officials will accept the SBI Bank Probationary Officer Application Forms till 22.04.2019, they must be fast enough in order to complete the registration process. As the SBI will go in verifying the Aspirants Applications as a part of Document verification, in order to make accept them for the Written test or not. That’s why after doing Apply For 2000 SBI Probationary Officer Jobs Online @ sbi.co.in they need to gather SBI Bank PO Syllabus for the exam and do perfect preparation for the exam and get ready for the Exam which will be held on the dates mentioned on the SBI PO Recruitment 2019 Notification. Those who Completed the Registration For the SBI PO Recruitment 2019 definitely have to Download www.sbi.co.in Probationary Officer Application because Application has its importance in the Selection process. If the Contenders do any mistakes in filling the Form they have to immediately modify them by contacting the SBI Officials, otherwise, they will face the problems in selection rounds. State Bank Of India after scrutinizing the Contenders through Written Test and Interview will make hiring the Contenders who performed well and will place them wherever the Vacancies available on the SBI Bank Across India as per the Norms of SBI PO Recruitment Notification 2019.